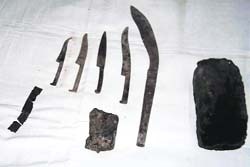 Weapons recovered during the digging near a gurdwara at Kailey village near Ahmedgarh. The area’s residents, led by Darshan Singh, chairman of the Budha Gurmat Parchar Trust, have urged members of the gurudwara management committee to get the articles recovered examined by experts of the archeology department and exhibit them for ‘sangat’, if found to belong to the guru. According to some history books the guru had visited this area in the course of his ‘dharam parchar’ tours sometime in 1621. Though Kailey village does not find any mention, a nearby village, Sidhar, is among the localities where the guru organized mass meetings for preaching the 'meeri peeri' concept.